This shot first appeared on the ‘Do You Know’ page of this web site and thanks to the following contributions I have the following information. ”The Crossley DD42 was ex Chesterfield Corporation. It was sold to Luxicoaches of Borrowash Derby in the 1960’s. 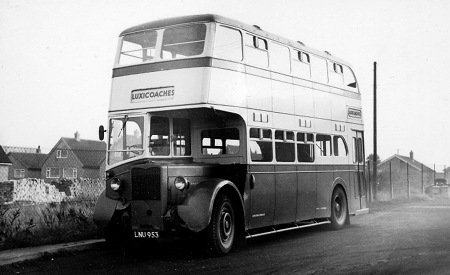 When it was with Chesterfield it had an open platform the doors were fitted later by Luxicoaches”. “The Crossley DD42 decker in lowbridge form was quite a rarity, and Chesterfield’s buses were all of this design, L53R I think. Only Plymouth and Luton Corporations took the lowbridge type, other than perhaps a few that were delivered new to independents, e.g. Mainwaring’s of Bignell End, whose fleet including a couple of Crossley deckers was acquired by PMT (Potteries Motor Traction) in 1953. Many of these municipal lowbridge Crossleys did have further owners such as this Chesterfield example with Luxicoaches. Plymouth examples passed to Wesley’s Coaches, Hedingham District, and I think…. Rosslyn of Par. A Plymouth example is now fully restored and preserved in the West of England Transport Collection I believe. Reading also had a dozen 52-seat lowbridge all-Crossley DD42/8s with HOE engine and constant-mesh gearbox. They were with the Corporation from late 1950 to 1967-68, no 95 surviving as a trainer till 1969. No 85 went on a trip to South Eastern France after withdrawal, and is now undergoing a very thorough rebuild. May be the reason why the ‘Gearless’ Crossley’s were chosen was to be ‘forward thinking and modern’? As every motor Bus at that time – apart from the Wartime Daimlers – had a ‘Crash’ Gearbox which some Drivers had difficulty using. It could also have been a ploy for drivers to make the change from Trolley-Bus to Motor-Bus easier whilst the two systems ran in tandem. The Atlantean (with it’s semi-automatic gearbox and fluid flywheel transmission) finally replaced the Trolley-Buses in 1963. If the reliability and fuel consumption figures had been better, C.P.P.T.D. may well have continued with the ‘Gearless Crossley’ up to the start of the Atlantean !! I can remember Reading Corporation Transport No 85 Crossley was in residence in a yard up the Woodcote Road north of Caversham near Reading in 1971. It was looking a little faded- what I could see of it- the owner of the yard was adamant that we weren’t going to get any closer! He didn’t trust teenagers! The Crossley buses made heavy weather of climbing St Anne’s Hill on the 21 service to Uplands Road in Cavesrsham Heights.Sometimes, I would get on and my friend’s older sister with her friends might be coming back from Westwood School which was always a pleasant surprise- what with the four seats together. Downstairs on the seats one was cautioned to mind your head and also "Children should not occupy seats while adults are standing". I went on a visit to the Mill Lane depot in August 1968- not long before the end of the trolleybuses- there was a 1961 Sunbeam ready to go for scrap- all the numbers and coat of arms painted out- the electric motor had gone, we were told, but it was bought for preservation and survives- the others went to Teeside. Anyway, I was allowed to start a Crossley. Of course, I didn’t have a camera- today all kids have their phones and it would be filmed and shown on YouTube. I think my friends thought I was mad. However, they did post me a nice postcard of Reading- of Broad Street with Sunbeam No 181 -our favourite trolleybus bang in the middle of the shot. 181 still survives and I have the postcard on a board in my kitchen! I’m glad to say that Reading Crossley-Crossley 85, which you recall seeing looking in Moodie’s Transport yard just north of Reading, has now been under cover for about 12 years in a bus museum about 15 miles from Reading and is undergoing a very meticulous restoration by Graham Green. Crossley DD42/5 DJY 965 has returned to Plymouth for further preservation with the Plymouth City Transport Preservation Group, during November 2014. It under-took an excellent journey from Cardiff to Plymouth under its own power, and is now stored under cover with many of our other vehicles. Great news to hear about DJY 965 ! I well remember how much work went into this restoration when at Winkleigh many years ago after it was rescued from a field in Northants ! Delighted its back home , and still runs so well.